We went and saw the Beach Boys on Sunday night... what a great show. I am not a big fan of the "Pet Sounds" album type of music but the old stuff that they are famous for was just fantastic. I must admit I was a but cautious about this show because they are 50 years older now and I was wondering if they would still be able to sing as well, there was absolutely no problems there, they can still belt out a song with the best of them. If you didn't go and you have the opportunity to catch them somewhere else, as the saying goes, do yourself a favour and go and see them, you will not be disappointed. Unfortunately I forgot to take my camera so I don't have any photos of the occassion but loved it anyway. It has been a busy week again. 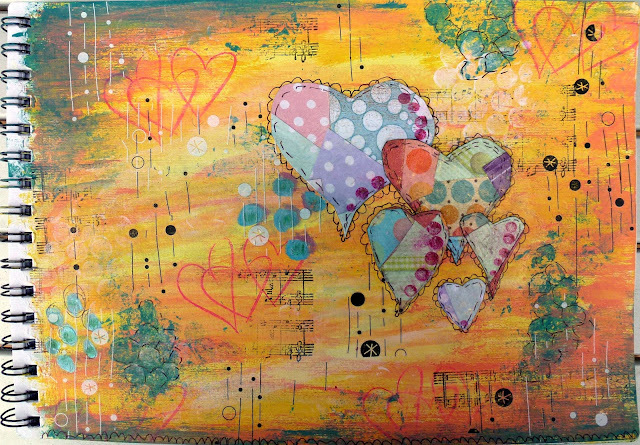 I am looking at week two of the videos in the She Has Three Hearts course I am doing with Christy Tomlinson. This is a photo of the first page I have created for week 1. I am pretty happy with the way it has turned out. I have used acrylic paints as the background, some stamping, bubble wrap stamping, rub-ons, and doodling. The hearts are scrap pieces of scrapbooking paper stuck to a piece of card and then cut into the heart shapes. The course is for Art Journalling but I am not big on journalling and the idea behind doing this course was to get some new techniques for scrapbooking layouts so there is no journalling on the page. I could see me sticking a photo on here and putting it in my scrapbooking album though.